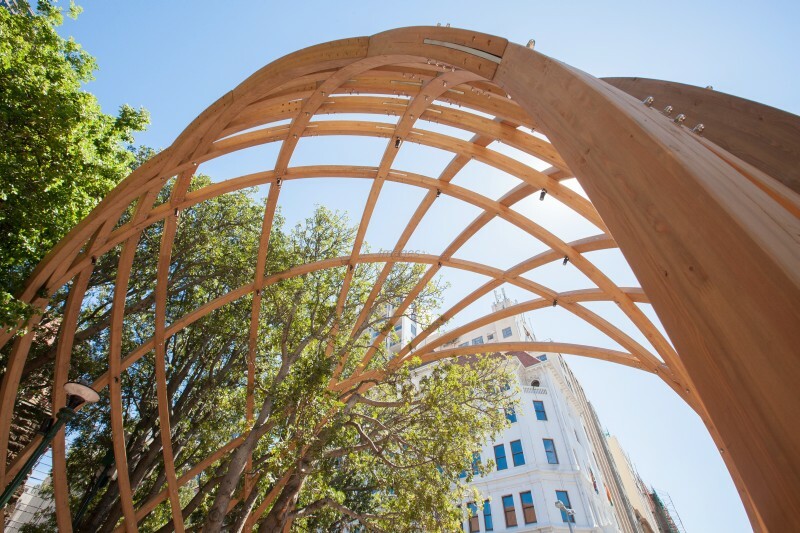 Situated at the intersection of Adderley and Wale Streets in Cape Town, this memorial arch was designed by Snøhetta and Local Studio for human rights activist and Nobel Peace Prize recipient, Archbishop Desmond Tutu. 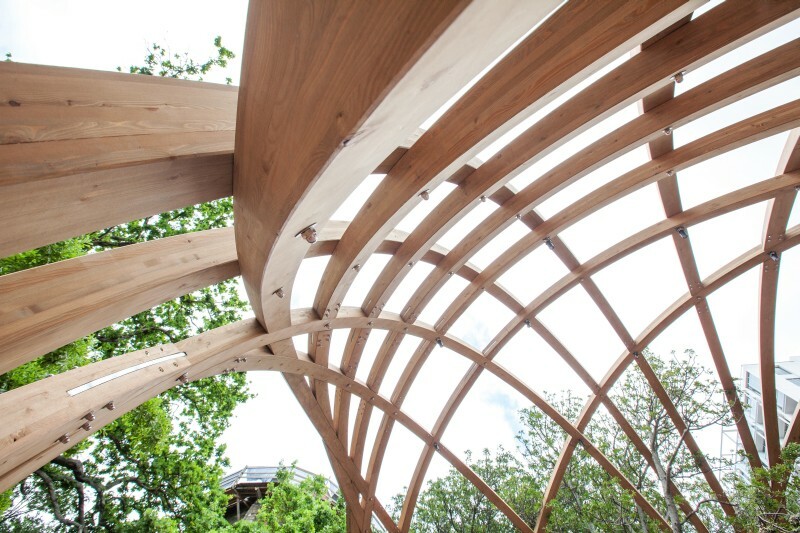 Manufactured by Swissline Design, the structure consists of 14 arching laminated spruce beams that stand 9m tall. Each curved and twisted beam was laminated with special imported glue and received a smooth, planed finish by using an overhead crane to tread the beam evenly. Installed around a protected tree, relying on exact measurements to slot in the twisted and interlaced beams with custom-designed brackets and joints, there was very little room for error. Finally, the timber beams were finished with an ultraviolet oil to protect it against the elements and give it a slight grey hue. Designed by Savile Row Architects, this beautiful timber ceiling with exposed profiled sprocket overhangs was installed using a concealed fastening system where all galvanised brackets and plates are slotted within the beams. The roof rafters and ridge beams are without tie beams putting immense stress on these well engineered connections. 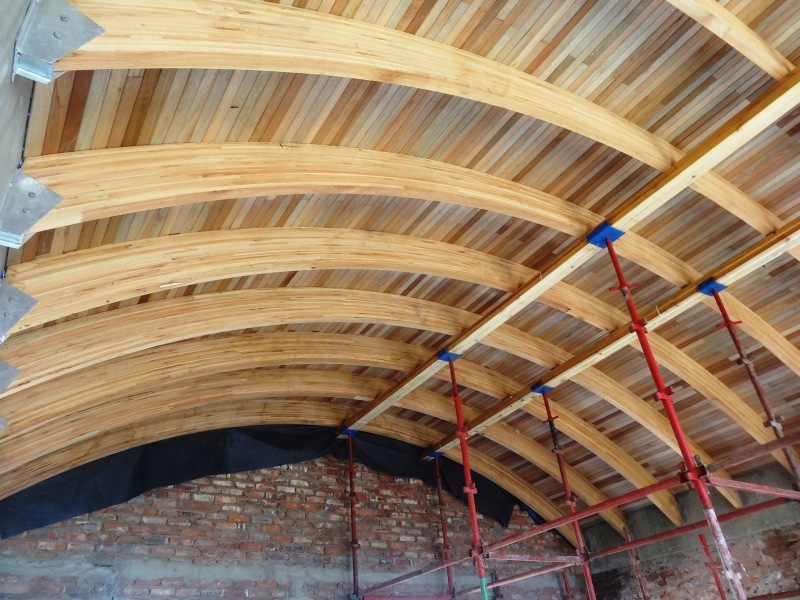 Spanning 6m at its max, all the beams were manufactured by RSB Group, using Saligna (Grandis) grade 7 glulam beams and Grandis tongue and groove ceiling planks. 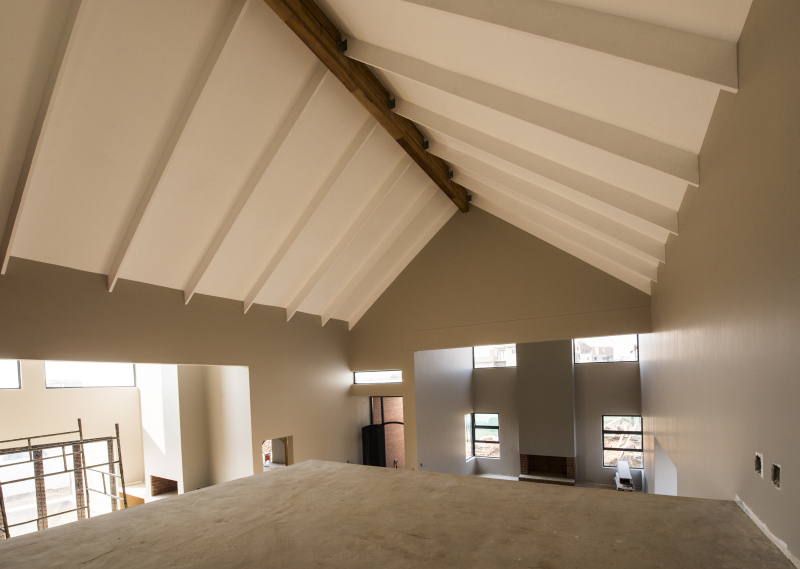 The ceiling of the main reception area of the Klerksdorp Community Centre was constructed using curved laminated Saligna (Grandis) glulam beams and a Grandis tongue and groove ceiling, manufactured by RSB Group. At its widest, the curved beams span 7,44m. 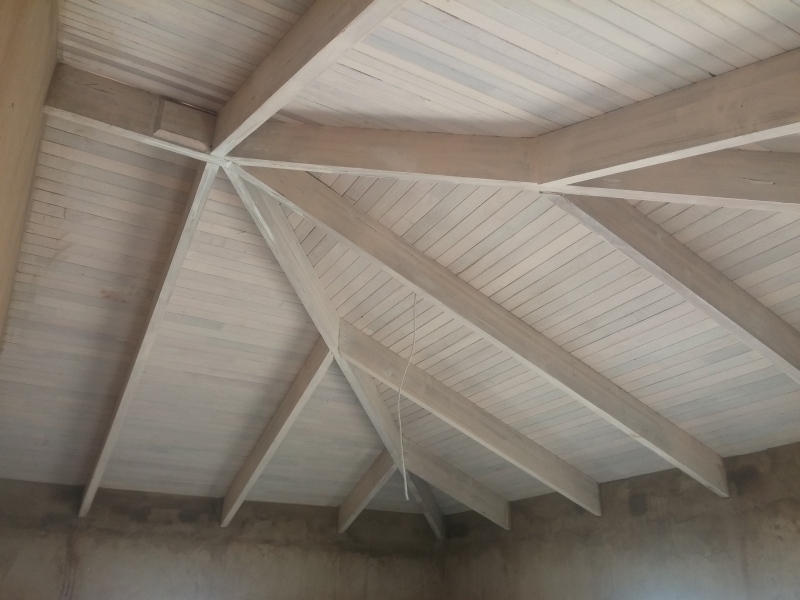 To create a ceiling with exposed trusses for this residence, the structural laminated pine beams are kept in tension with 5mm steel plates and 16mm diameter steel rods. Although the steel plates and rods were included as structural components, they also contribute to the aesthetic value of the roof. Due to the additional weight of the laminated timber and decorative steel details, the trusses were much heavier than standard roof trusses. A bespoke steel bracket was therefore installed over the supported laminated beams so that the steel component of the trusses could be welded to the support beam. In addition to the fixing detail as support the bracket adds to the aesthetic component of the design. Full thanks and acknowledgement are given to Swissline Design, RSB and LCP Roofing for the images provided.